What Is Wedding Insurance (and What Does It Cover)? What Are the Different Kinds of Wedding Insurance? You can also purchase the two in a bundle that will cover both. Before buying wedding insurance always ask the venue if they cover event liability. Wedding event liability coverage may cover different things, for example, bodily injury and property damage. You may also need to add "Host liquor liability insurance" which covers alcohol-related incidents you may be held accountable for. Every wedding insurance policy is different and will have different policy limits or special features based on the insurance company you purchase coverage from. The above list is only a guide to commonly covered things on wedding insurance for you to ask about. *Military deployment, for example, may or may not be covered by all wedding insurance, but USAA does specifically cite this coverage. So be sure and ask the details of the special limits in the policy from the insurance company you are buying wedding insurance from to make sure your own specific concerns are "covered". What's Not Covered by Wedding Insurance? Wedding insurance doesn't cover when people get cold feet or pull out of a wedding. Wedding insurance is for things that are not within the couple's control putting their event at risk. Will Home Insurance Cover Your Wedding? Wedding insurance is not personal insurance, so your home insurance is not intended to cover a wedding. However, many home insurance companies may be able to offer you riders or event liability policies and help you get the right insurance coverage for your event. Home insurance covers your personal liability and personal property. Find out from your home insurance what happens if gifts get stolen, or if your grandmother's necklace disappears off your neck during the wedding. These things may be covered, but subject to the deductible. A lot of time, effort and planning go into the wedding day. A wedding insurance company is familiar with all kinds of things that go wrong and by having a policy the insurance company will have your back if something goes wrong and it's covered. The cost of wedding insurance is minimal compared to the cost of the wedding and what is at risk. Although pricing for wedding insurance varies, wedding event liability coverage could start on average at around $175 for $1 million of coverage. Depending on the various options and packages you could be looking at between $200-$550. In a study by Travelers, from 2011-2015 30 percent of wedding insurance claims were due to vendor issues. Then in 2017, CNBC cites 40 percent of wedding insurance claims were to cancelations due to weather. AON, an award winning provider of Wedding Insurance under their WedSafe product, released some of their data from wedding insurance claims paid, and in 2017 they paid 40 percent wedding insurance claims for postponement or cancellation. Compared to AON's 2016 data below, the claims paid were different, but you can see that wedding insurance does actually come into play often enough even though the reasons for payout will change due to circumstance and weather year to year. You should look into wedding insurance as soon as you are planning your wedding and have an idea of the venue. Sometimes the venue you select, whether you are serving your own alcohol and other aspects of your day will dictate what kind of insurance you need. Understand what you are most interested in insuring yourself against, for example, if you have special jewels sewn into your dress and you want that insured, ask if there are limits for this kind of item. Jewelry or special items may not be covered on a wedding insurance policy or may be limited. Ask the venue what they cover. Ask your home insurance provider what they cover or if they can add a rider to your home policy. If applicable, have your parents contact their home insurance company to ask if they have any coverage, especially if they are the ones paying for the wedding or the venue. 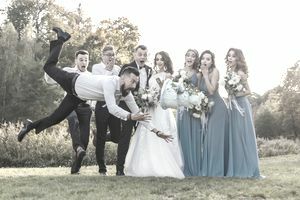 Compare the coverages from different wedding insurance companies to understand what they cover and under what conditions. Then you can make a decision. You may find out that you can have some coverage on your home insurance. For example, you can insure your engagement rings on a rider on your home policy. Some companies even offer engagement ring insurance as a stand-alone.